What Is The Best Snow Brush For Your Car in 2019? →What Is The Best Snow Brush For Your Car in 2019? Removing snow and ice from your vehicle is not always easy. If you thought you will never have to scrape off ice from the windows and windshield, you are wrong. That said, you need to learn how to remove the snow and scrape the ice off your vehicle. But, even if you become a pro at this, you’ll still need to purchase a good snow brush to achieve it. A snow brush is an essential tool for your car in the winter. When you are looking for a snow brush, you cannot just purchase the first one you see. Your choice must be based on not pricing only, but also the size of the car, the size of the handle, the extension of the handle, etc. We picked the top 7 snow brushes of this year. Why Do You Need A Snow Brush For Your Car? Is It Better To Just Leave The Snow On My Car? What Should You Look For In A Snow Brush? Can Using A Snow Brush Damage Your Vehicle? Which Are Better – Nylon or Foam Brushes? What Should I Do When It’s Snowing Outside? The Hopkins 532 Mallory takes the first place in the list this year because of its durability. Most people wish to purchase a snow brush and get it over with, instead of having to do the choosing every year. Those who own small vehicles and are in search of a high-quality brush should definitely try out this product. The Hopkins 532 Mallory is one of the most durable brooms on today’s market. 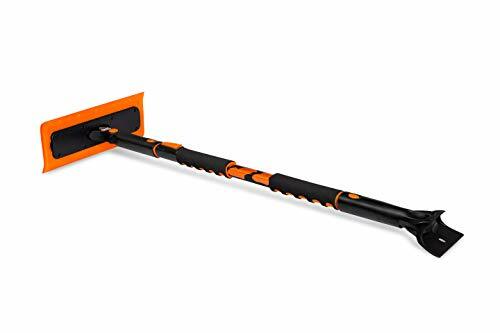 Also a great value for the money, this product comes with bristles that allow you to swipe a lot of snow with a single stroke. Its handle measures only 26’’, so it is not recommendable for larger vehicles. 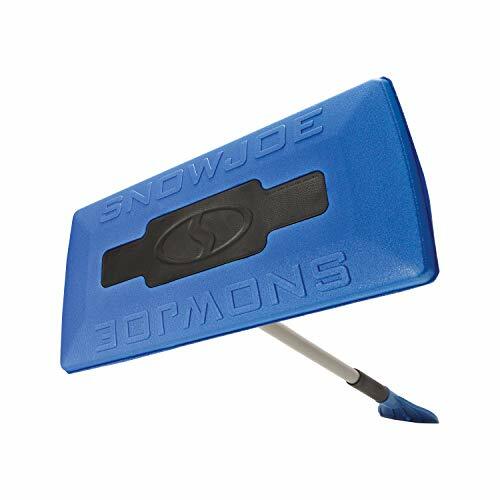 Combining stellar quality and light wear brush, this broom by Snow Joe is another excellent solution for your snow and ice problems. 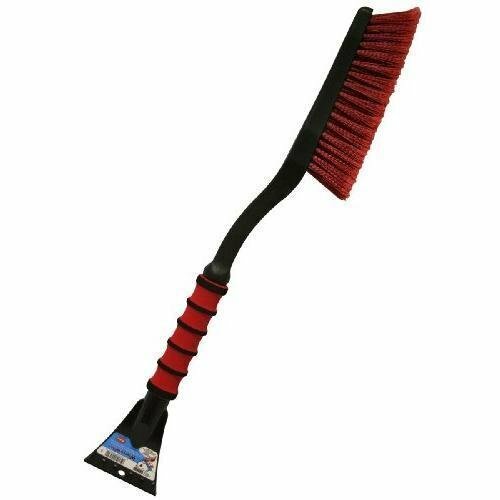 If you are looking for a simple-to-use brush to clean the snow and ice from your vehicle, this is a great option. When we say that it is light wear, we mean 1.2 pounds! Clearing up the ice and snow from the windshield and windows has never been easier! With an extension possibility of forty-six inches, you can use this brush to clean most vehicles with ease. The best part is – you don’t have to switch tools to clean ice, snow, or frost. The product has a foam head sweep that is non-abrasive, meaning that you won’t be hurting your car’s paint in the process. Start with the comfortable grip and move to the durable material and the amazing performance – the Hopkins 80037 Subzero brush has it all! The price is certainly not the cheapest you can find, but its durability and performance make it all worth it. The Hopkins 80037 is definitely a remarkable brush for your vehicle. If you are willing to invest in a longer-lasting, high-quality snow brush, this is a great choice. The scraper blade on the item is very broad and allows you to clean the frost, ice, and snow within minutes. You can also extend the brush up to 60 inches, which means that this product is perfect for both small and large vehicles. 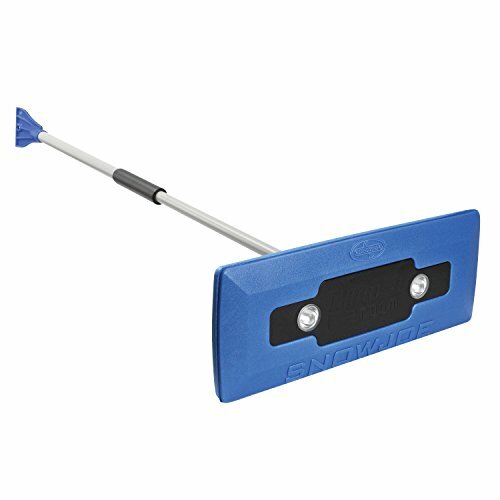 In addition to the broom, the 80037 Subzero has a squeegee. The combination of the two will help you scrape off the wet and heavy snow with ease. Are you constantly struggling with reaching the snow and ice on your vehicle? The BirdRock Home Snow MOOver is an excellent solution for those with large cars, as well as vertically challenged individuals. For those who seek a quality, affordable brush that extends more, this is the perfect option. This brush extends up to 62’’, making it possible for you to reach the snow and ice on the largest vehicles. This product is a combination of a scraper and a jaw, and the ice scraper is sold separately. You can remove the jaw and place the ice scraper if you decide to purchase all parts. The jaw is very helpful since it allows you to break up the ice before you clean it off your vehicle. Cleaning the snow and ice from your car is never a pleasant thing to do out in the cold, especially if you have to do it often. With the Hopkins 533 Mallory SnoWisp, you can enjoy a much more comfortable experience when performing this task. If you are in continuous need of a brush that will help you clean snow of the car on daily basis, the Hopkins 533 Mallory SnoWisp is a very comfortable tool to use. Its ergonomic grip has a thick foam that helps you clean off snow and ice much faster. For your convenience, the blade from this brush unclips to make it possible to clean areas that are hard to reach. However, since the brush extends only to 26’’, you should reconsider buying it if you have a large vehicle. The brand that produces the Snow Joe SJBLZD is very popular, and this product is a very versatile snow brush. With an LED light, an emergency blinker and a large foamy head, this may just be what you needed if you were looking for a highly-capable snow brush. The SJBLZD brush is more than just a regular snow brush. This brush is extendable up to 49’’, making it possible to use on vehicles of all sizes and types. Its foam head is non-abrasive and has the capacity to clean wet and heavy snow off the vehicle. Another notable feature is the dual LED lights. Combined with an emergency blinker, these features give you the much-needed illumination to clean your vehicle in the dark. Finally, the brush turns into an ice scraper that aids you in cleaning the snow buildup from your windows and windscreen. The SkaDierect brush by Show Angel is a marvelous product for those who seek a more affordable option. This is the cheapest brush on our list, but it is very robust and reliable. For your convenience, the Snow Angel snow brush turns into an ice scraper in addition to being a brush for snow. Its telescoping handle is extendable up to 24 inches, and can be retracted up to seventeen. This makes storing very simple. Moreover, this brush features bristles that allow you to easily swipe away the snow and ice from your windshield and windows. Its sharp ice scraper makes it possible to cut through the deposits with ease. Despite the small size, the extending range allows you to cover the entire windshield of the majority of vehicles, including trucks and SUV’s. The Snow Angel brush is made with a heavy-duty plastic scraper and solid aluminum. For starters, not cleaning your vehicle puts you at a very high risk of accidents. Driving on the snow is risky, but so is driving with snow and ice on the surface of your car. If you do not make sure to have a clear vision on all sides, you are more likely to make or cause an accident on your way. You should never, ever leave snow on your vehicle. Police services urge you to remove the snow and ice from your vehicle. Whether it is a verbal, written warning or a major fine, this will depend on the amount of snow and ice on your vehicle, as well as your state’s laws. Still, they will surely not allow you to drive when your car is in such a bad condition. Not clearing ice and snow off your vehicle can damage your motor, linkage, the wiper blades, the rear wiper, and arms. If you let snow just pile-up on your vehicle, this can cause you very costly repairs. As soon as you decide to start the car again, you may encounter very serious problems with its parts, including the motor. The reason why it is illegal is because it is dangerous, and not only for you but for other drivers, too. When the vision in your windshield, rear window or door glass is bad, you are creating a strong risk for yourself and others. This depends greatly on your location, budget, and size of the vehicle. Firstly, you may need a stronger tool if the snow in your area is common, heavy and wet. If it is rare and easy to clean, you can opt for a light wear, less-durable option. Of course, there is also the matter of budget. You will find that there are differently priced brushes on the market. And finally, there is the issue of the size of the vehicle. If your vehicle is larger or you are short in height, you may want to purchase a show brush that is extendable. Yes, choosing a bad snow brush can be very bad for your vehicle. If a brush is made from nylon or other bad material, this can ruin the paint job of your vehicle. In addition, when the brushes do not have safety features, you may scratch the car when trying to scrape off the ice. In addition, you will probably be looking for a brush that has an ice scraper. If you are not careful with the ice scraper, you can easily damage your vehicle. Foam brush, of course. Snow brushes that are made of nylon make it more probable that you will scratch or damage your vehicle in the attempt to remove the snow. If you want to keep your car paint job intact, you should opt for a foam brush. If you find a quality brush that meets your needs, you can use this brush to clean the vehicle anytime it is snowing. Foam brushes are the safest option since they minimize the chances of scratching and damaging the vehicles. If you live in an area where it is constantly snowing, you may want to consider buying a car cover. In times of snow, a good snow brush is a definite must. This is an important tool for your safety, as well as for maintaining the quality of your vehicle. If you fail to clean the snow and ice off your vehicle, you might create unnecessary expenses and accidents along the way. Choosing a snow brush is not something you should rush into. This may seem like a simple purchase, but you surely would not want to get a low-quality brush and get stuck without the vehicle when it breaks in the middle of cleaning your car. Or even worse – a low-quality brush can destroy your vehicle!